In the summer of 1975, Steven Spielberg’s blockbuster movie ‘Jaws’ was released. I remember the film so well. It was probably the first movie I watched unsupervised in the cinema with my girlfriends – excitement, suspense, and pure fear all rolled into one. And yes, I did watch most of the 2 hours through my fingers. What I did not realise at the time, was the damaging legacy this movie would leave for the shark as a species. After nearly 40 years, the Great white shark is still portrayed as a villain – a blood thirsty, evil, man-eating monster. 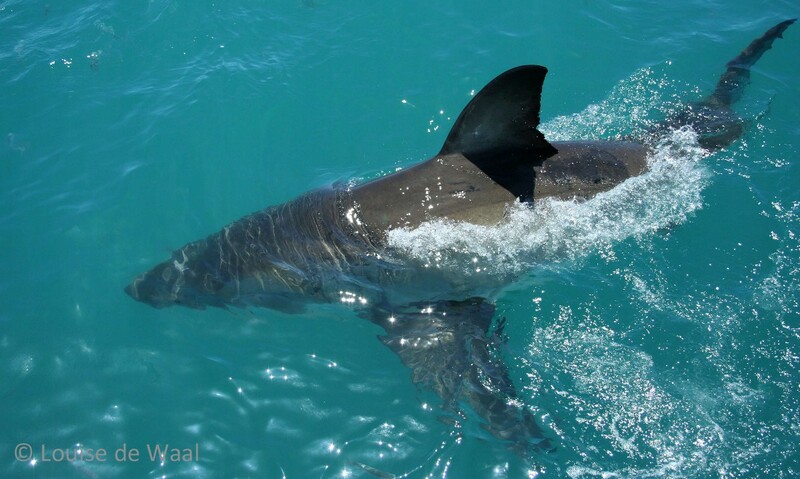 After every unfortunate shark attack, the debate of shark culling and shark nets is jolted back to life, even though non-invasive methods, such as the Shark Spotters Programme in the False Bay area, are highly effective. Advertising campaigns, like Rethink the Shark, don’t seem to have much of an impact on people’s irrational fear and perception either. Sixteen million years of evolution created a highly adapted and successful marine apex predator. A striking and graceful creature sadly listed as vulnerable on the IUCN Red List of Threatened Species. The reasons for its decline most of us are familiar with, like the threats from dying in gillnets as bycatch, overfishing for the shark fin soup industry, and death by suffocation in shark nets protecting our beaches. However, what even the research community didn’t realise was how small the global Great white population actually is – estimated to be as low as 3,000-5,000 (at best 10,000). This puts the Great white at a similar risk of extinction as the rhino. Not surprising that some researchers feel its status should be downgraded to threatened. 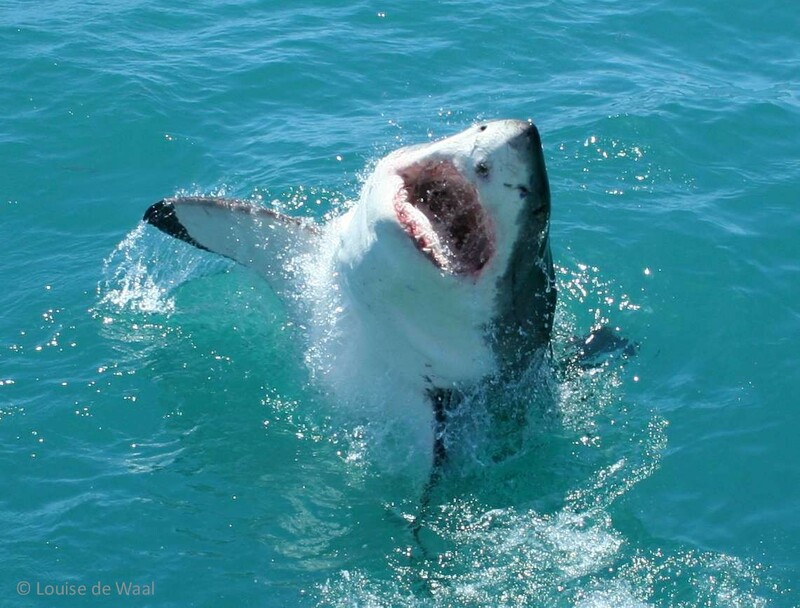 South Africa is fortunate to have one of the largest Great white populations, especially around Dyer Island (near Gansbaai), where shark tourism has boomed in recent years. It was here, with Fair Trade in Tourism certified Marine Dynamics, where my love for sharks was truly sealed. The boat ride out to Shark Alley is an exhilarating experience in its own right. Mooring, chumming, and waiting. Those not averse to the cold were suiting up, while I stayed on deck with my trusted companion, my camera, waiting for the quintessential triangle slicing through the water’s surface. When it does, the feeling of awe, respect, and pure bliss were overwhelming. Contrary to popular belief, shark cage diving does not habituate sharks to boats. These highly intelligent and inquisitive creatures just love to suss out anything, including boats. They come up close and personal for the ultimate adrenalin rush. They hang around for maybe 10-15 minutes before moving on. And the waiting game resumes. I am a self-confessed conservation addict. Every time I am exposed to the immense beauty of the African continent and the plight of so many species, I just want to scream. 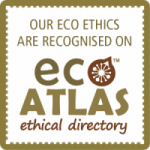 Tell the world how important it is to protect the few remaining intact eco-systems with all its flora and fauna. But what I realised when shark cage diving with Marine Dynamics is that you will not love and protect what you don’t understand. Even though shark cage diving is considered contentious, in my mind it plays a hugely important role in changing people’s attitude towards this unfairly treated animal. It raises awareness of the shark’s vulnerable conservation status. It also explains why it is important to have apex predators in our oceans. While giving people a truly once in a lifetime experience – the wet thrill. 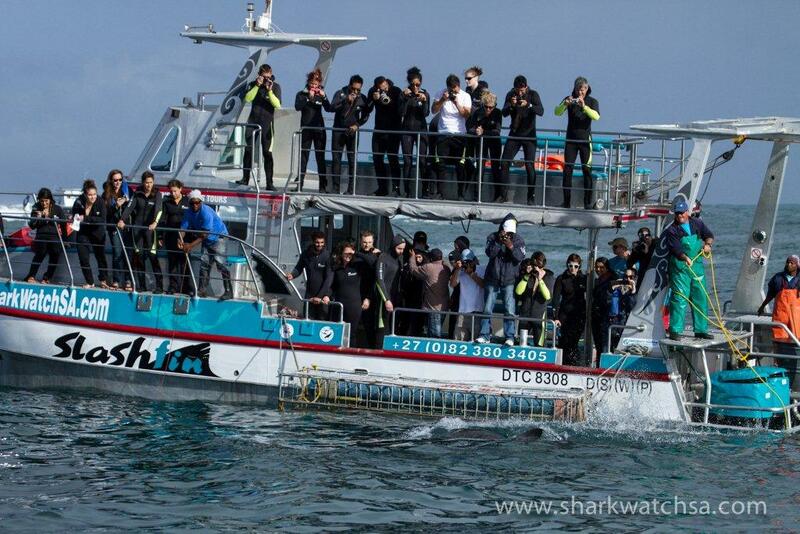 The responsible shark diving operator is the vehicle to a greater understanding of sharks in general and making the Great whites ambassadors for its species. The personal and mind-blowing experience of encountering a Great white up close in its natural environment might just swing people’s perception and save this species from extinction. This story first appeared on The Good Holiday and was also published in the Responsible Traveller Magazine (Issue April-May 2015, page 52-57). You can also read it as a PDF link.